The liver is a large glandular organ, whose functions include decomposition of red blood cells, plasma protein synthesis, hormone production, secretion of bile, and conversion of sugars into glycogen, which it stores. The liver is also responsible for processing many vitamins and nutrients into a form that can be utilized by the body, as well as detoxification of various substances. Modern living involves daily exposure to substances that are toxic to our bodies, which imposes a heavy load on the liver. Therefore, a healthy liver is critical to well-being. Certain lifestyle risks and medical conditions make it all the more important to ensure that the liver is being maintained at its functional best. Your liver is subject to continuous free radical exposure and is particularly vulnerable to mitochondrial decay. Reduced cellular energy output in the liver adversely impacts a growing percentage of the population.8 According to the most recent estimates, one third of Americans now require targeted support for healthy liver function. In Europe and Asia, herbal liver tonics have been in common use for centuries. The effectiveness of the herbs used has been validated during the past decades through modern research and clinical studies. These herbs generally contain antioxidants, cell membrane-stabilizing agents, bile secretion-enhancing compounds, or nutrients that prevent depletion of endogenous antioxidants such as glutathione. Hepatoprotection is beneficial not only for the liver but also for the overall health and vitality of the body. 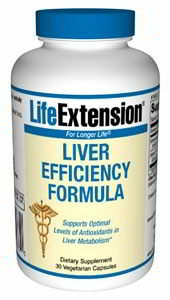 Liver Efficiency Formula features two state-of-the-art molecular energizers shown to promote healthy liver function at the cellular level. The first is Schisandra chinensis, an adaptogenic vine native to Asia with a half-century of research9 and nearly 400 published studies that validate its system-wide benefits. Researchers have discovered that the lignans in Schisandra fruit specifically support healthy levels ofglutathione— the cell’s own antioxidant defense system. Schisandra’s bioactive compounds have been shown in pre-clinical studies to be readily absorbed in all segments of the intestine. And in animal studies, Schisandra was shown to improve glutathione status dramatically in depleted liver cells. Liver Efficiency Formula also contains Extramel, a fruit concentrate derived from non-GMO muskmelon (Cucumis melo), a natural source of the antioxidant superoxide dismutase or SOD — one of the human body’s most powerful free radical neutralizers. Extramel®’s efficacy and safety are backed by published clinical research. In a recent placebo-controlled trial,15 a group of 70 volunteers aged 30-55 taking 10 mg of Extramel per day experienced significantly greater energy levels, improved physical performance, and better mood after only four weeks. Other ingredients: rice flour, vegetable cellulose (capsule), L-Leucine, palm oil.